Who was the real Iñigo of Loyola? Iñigo of Loyola was 30 years old when his leg was shattered by a cannonball during the siege of a castle by the French military in Pamplona in 1521. This pivotal incident, which might have been merely a tragic setback to another person, marked the beginning of his new life. After Ignatius stayed in Pamplona for several days, his French captors, who treated him "with courtesy and kindness" brought him back to his family’s castle, where the doctors reset the bone. To do so they had to break the leg. "This butchery was done again," he writes in his Autobiography. His condition worsened and those around him, worried that he was about to die, arranged for him to have the last rites. Finally he recovered. Yet Ignatius noticed something troubling: the bone below one knee had been poorly set, shortening his leg. “The bone protruded so much that it was an ugly business.” Now his vanity took over. "He was unable to abide it," he wrote, "because he was determined to follow the world." He couldn't abide the idea of being thought unattractive. Despite the pain involved, he asked the surgeons to cut away the bone. Looking back, the older Ignatius recognized his foolishness. "He was determined to make himself a martyr to his own pleasure," he wrote. “He was determined to make himself a martyr to his own pleasure,” Ignatius wrote. During his subsequent convalescence, Ignatius was unable to find books on what he most enjoyed reading: adventure stories and tales of chivalry. The only things available were a life of Jesus and the lives of the saints. To his surprise, he found that he enjoyed the tales of the saints. Thinking about what the saints had done filled him with a sense that they would be "easy to accomplish." Still, he was attracted to the ideals of knightly service, and when he wasn't reading about the life of Christ or the lives of the saints, he mused about doing great deeds for "a certain lady." He considered what clever things he would say to her and what gallant deeds he would do on her behalf. Even though her station was higher than a countess or a duchess, Ignatius was obsessed on winning her over with daring exploits. In this way he wasn't very different from some men in our time, or any time for that matter. Ignatius began to understand that these feelings and desires might be ways that God was communicating with him. So he went back and forth, thinking about doing heroic things for the noble lady and doing heroic things for God. 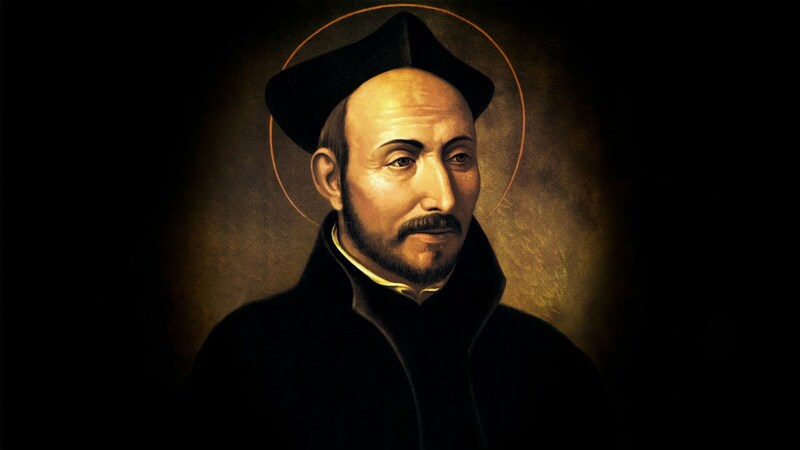 Then a strange thing happened, something that would influence not only Ignatius, but the life of every Jesuit, and anyone who has followed the way of Ignatius. Ignatius slowly realized that the aftereffects of these thoughts were different. When he thought about impressing his "certain lady" with exploits on the battlefield, he felt one way. When thinking about doing great things, and even undergoing hardships, for God, he felt another. Yet there was a difference. When he was thinking about the things of the world, he took much delight in them, and afterwards, when he was tired and put them aside, he found that he was dry and discontented. But when he thought of going to Jerusalem, barefoot and eating nothing but herbs and undergoing all the things that the saints endured, not only was he consoled when he had these thoughts, but even after putting them aside, he remained content and happy. He did not notice this, however; nor did he stop to ponder the difference until one day his eyes were opened a little, and he began to marvel at the difference, realizing from experience that some thoughts left him sad and other happy. Little by little he came to recognize the difference between the spirits that agitated him, one from the enemy and one from God. Ignatius began to understand that these feelings and desires might be ways that God was communicating with him. This is not to say that Ignatius found God and women in opposition. Rather, he began to see that his desires of winning fame by impressing others drew him away from God. His desires to surrender to a more generous and selfless way of life drew him towards God. What religious writers call a "grace" was not simply that he had these insights, but that he understood them as coming from God. As a result of his experience, Ignatius began to understand that God wants to communicate with us. Directly. This idea would get Ignatius in trouble with the Inquisition and land him in jail. (Ignatius had his own problems with "religion" at times.) Some critics suspected that Ignatius was trying to bypass the institutional church. If God could deal with humanity directly, what need was there for the church? As I’ve mentioned, religion enables people to encounter God in profound ways in their lives. But Ignatius recognized that God could not be confined within the walls of the church. God was larger than the church. Today the Ignatian notion of the Creator dealing directly with human beings is less controversial. It's assumed by those on the "spiritual but not religious" journey. The far more controversial aspect is that God would speak to us through religion. But Ignatius’s insight is as liberating as it was in his time. And it is here that Ignatian spirituality can help even the doubtful find God. Some agnostics or atheists await a rational argument or a philosophical proof to demonstrate the existence of God. Some will not believe until someone can show them how suffering can coexist with the belief in God. A few may even hope for an incontrovertible physical “sign” to convince them of God's presence. But God often speaks in ways that are beyond our intellect or reason, beyond philosophical proofs. While many are brought to God through the mind, just as many are brought to God through the heart. Here God often speaks more gently, more quietly, as he did during Ignatius’s convalescence. In these quiet moments God often speaks the loudest. As an alum of four Jesuit schools, a past member of the Jesuit Volunteer Corps, and a participant in three trips abroad to learn about Ignatius and Ignatian spirituality, this year is totally different for me. The Feast of St. Ignatius is a reminder of that. I am dealing with Jesuits who betray the trust of abuse victims and allow Jesuit abusers to return to ministry and teaching. I am dealing with a Jesuit province that has never once made hundreds of male survivors go to court, but made me, a female victim, do that even after they found me credible. I am dealing with a Jesuit superior general in Rome who fails to address any problems or misconduct in the provinces, ignoring solid proof that this misconduct exists. The feast of St. Ignatius means something very different this year. Jesuits lie, Jesuits are not trustworthy, Jesuits are sexist, etc. When I posted this comment on Saturday, it appeared, but by this morning it was gone. Then it disappeared again. Jesuits have been caught many times censoring comments they do not like that do not violate any rules. I am now preparing to tell this story in a national Catholic paper, after so many people have told me about problems in the Jesuit order in the United States that religious superiors are ignoring, the prinicpal problem being gay Jesuits soliciting young men. (Former Jesuits tell this story.) I also think it should be made known how differently the Jesuits treat male and female victims of abusive Jesuits. hm....Ignatius, Patron Saint of Cognitive-Behavioral Therapy. never noticed that before. thanks for the illumination. A happy Feast of St Ignatius to you and the whole Company of Jesus! My experience with atheists or agnostics is that they resist any evidence presented to them no matter how logical. The science is overwhelming that the universe/world is designed. They also reject any philosophical argument no matter how logical. They are committed to an ideology they cannot defend so they must reject everything presented to them. Obviously there are exceptions and every once in a while you hear of a long time atheist renouncing this form of belief but the ones I have met are intransigent. Ironically, they based their beliefs on faith, sounds contradictory, that evidence will arise to eventually support their beliefs. The theodicy debate is also one that is usually pretty shallow and it would be interesting to see it discussed on some Catholic site some time. Maybe Fr, Martin or another Jesuit may want to take it on some time.